Sylvia is not yet 70, but she is going blind and in a nursing home, and fighting it every step of the way. She complains about the food, the care, and refuses to try new ideas to learn how to cope with her loss of vision. In the style of The Stone Angel by Margaret Laurence, and with a proud and bitter voice not unlike Hagar Shipley, Sylvia tells us her story. Syliva was born into Irish aristocracy, but falls in love with a man from Newfoundland who is in Dublin studying to be a doctor. Breaking ties with her family, she settles in Newfoundland with her new husband. Except that she has trouble settling. She keeps herself at a distance from the rest of the community. She seems only to survive from day to day, just waiting for her life to change, get better, for someone to recognize her importance. But in Newfoundland, that’s not going to happen, and her story takes us on her sometimes painful journey of discovering this for herself. … my expectations of what to expect of life in this new world were distorted and unrealistic. I constantly looked for more because I believed that was my right, but what I got was never enough. I thought this book was excellent, which just makes me even more sorry to tell you that Kate Evans passed away in 2016. Like Silvia, Evans came to Canada from Ireland and made her home in Newfoundland. I hope she found it easier to settle in than Sylvia did. She may not be writing any more books, but I will be sure to check out her first one, Where Old Ghosts Meet. This book has also been reviewed at The Miramichi Reader, where it has earned a spot on his 2017 longlist for the “Very Best Book Award” for fiction. 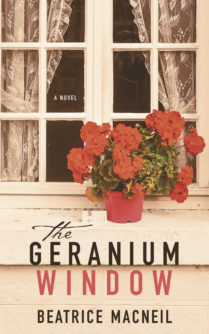 The Geranium Window is about a family in peril; in peril from the husband/father, the regrets of the past, and the actions yet-to-come. Alfie, a young neighbour, observes it all, photographing what he can. With his camera, he captures the lost years of Rosie, the pain of Arthur, the doubts of Anntell, and the hidden beauty of Joseph. Upon the death of her husband, Rosie thought they might finally be free, but the worst was yet to come. They saved all their regret for the edge of their graves. I found this story engrossing (she can spin a good depressing tale! ), but the language was too “flowery” for my taste. (“Rosie Briar spun the hard wheel of misfortune with the hand of innocence well hidden under a soft Sunday glove.”, “Why did she leave Arthur alone to collect his own rage like a child in the wilderness gathering wild berries to fend off starvation?”) I also found that near the end I was anxious for Alfie and Anntell to find each other in a more timely fashion. I know that Beatrice MacNeil has many loyal fans, and no doubt they will be happy with her latest novel. This is my first time reading one of her books, but I intend to read more, perhaps starting with Where White Horses Gallop, which is sitting on my shelf. For a more detailed review, pop over to The Miramichi Reader. Thank you to Breakwater Books for sending me a copy of each of these books for review! The Inward Journey sounds more like something I’d pick up. Terrible that the author passed away. I’ll definitely keep it in mind and put it on my TBR. Glad to hear it! I think the writing style is completely a personal preference, so maybe you will love it. 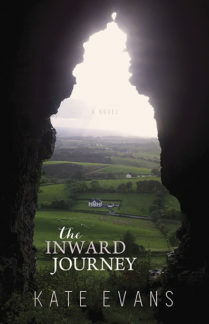 Having enjoyed The Stone Angel, I think I would definitely like to read The Inward Journey. I like the sound of the plot setup for the other one, but would likely find the language bothersome. I loved that she reminded me of Hagar, but ended up being a gentler version of her. Because part of the story took place in a nursing home, it also reminded me a bit of Harbour View by Binnie Brennan, which I also loved. You are always reviewing interesting sounding books that are completely new to me! The Inward Journey intrigues me. I have a fondness for Ireland, as my aunt and uncle have moved there (to stay, apparently) and I have visited there once. I hope to go and stay with them again! I love reading immigrant stories. There are so many different experiences – not one is the same. I think you’d enjoy this one! Poor Rosie – she was just waiting for her husband to be gone, but the result of it wasn’t what she was hoping for. Great for people who like depressing stories! I like the sound of The Inward Journey. As I am starting to pick books for Reading Ireland Month, I thought about the similarities of the Can Lit and Irish Lit I’ve been reading over the past few years. There’s so much melancholy and loneliness, it seems to me, and it sounds like there’s plenty of that in The Inward Journey. If I hadn’t read The Inward Journey back in January, I might have included it in Reading Ireland Month since the author is originally from Ireland. I did that last year, too. A lot of people in Atlantic Canada have Irish and Scottish roots.